Portland, OR – In the first installment of “Around the West in 95 Horsepower,” we talked a bit about where we were headed and what we did to prepare. In this segment, we’ll talk about our first day on the road. We made it an early night on Friday, August 28. We attended a good friend’s wedding reception, and went to bed. The night before we made sure we had everything we’d need and that everything was in order. The trailer was prepped, our backpacks were loaded, we had all the food we’d need for the first few days. An early rise on Saturday at 4:30am ensured plenty of time to pack and hit the road. We’d already prepacked part of the trailer and threw our sleeping bags and pillows in the roof top tent. We took our ARB fridge/freezer to the truck and plugged it in, and hoped our wiring job was sufficient. We loaded up with food, water, and our bags, and hit the road. Tilikum Crossing, Bridge of the People in Portland, Oregon on a hazy Saturday morning. Our route on day one would be a simple straight shot from Portland, Oregon east on Interstate 84 through the scenic Columbia River Gorge. While, we’ve been through it countless times, its beauty never ceases to impress. However, this trip, it was a little different. This was taken at about 8:30am. Note the red moon from the smoke in the air. Photo is around Hood River, Oregon. 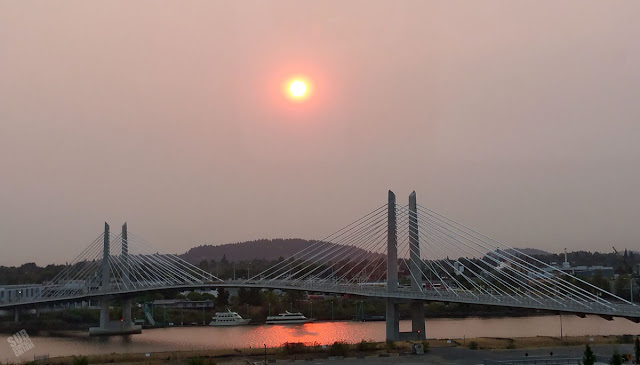 Due to the incredible amount of fires raging in both Oregon and Washington, and because of a shift in the winds, the Gorge was extremely smokey. I don’t know the actual visibility numbers, but if I had to guess, it was under a mile. The majestic hills were all shrouded with a gray haze, partially obscuring their full majesty. At about 8:30 in the morning, you could’ve sworn it was still dawn, as the sun was mottled by translucency. Plus, it smelled like someone started a camp fire in our ventilation, which provided all the side effects of a camp fire, including burning eyes. There was evidence of fires not only in the air, but all along I-84. Burnt patches of grass appeared frequently and in varying degrees of size. Some areas were vast, looking as if the entire hillside had been burned black. Others, were smaller and were stopped by the ribbon on Interstate. As we hummed along on our 29-inch Kumho Road Venture MT tires, I got to thinking that this would likely by one of the only times I was grateful for Oregon’s maximum highway speed limit of 65 MPH. The Sidekick is very comfortable at this cruising speed, which is just below the threshold of our unsolved vibration, which comes on around 65–70 MPH. Due to the Sidekick’s tiny fuel tank—11 gallons—we stopped frequently for gas. This isn’t necessarily a bad thing, as it gives us the opportunity to regularly stretch our legs and breathe in more smokey air. 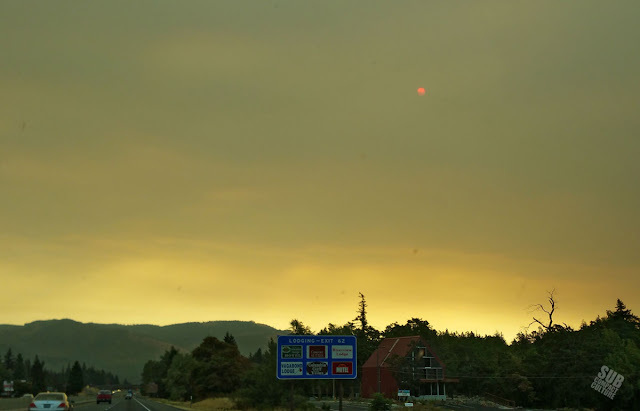 At nearly every fuel stop in Oregon, the station attendant would comment, “Sure is smokey out there.” It sure was. Our route from Portland to Murtaugh ran around 577 miles and was mostly interstate highway. After zipping past Pendleton, home of the Pendleton Round Up, we came to our first major grade: Cabbage Hill. At a 6% grade, Cabbage Hill, likely named after the only thing that grows here, is a long, steep slope, which required a slow 35–45 MPH crawl in second and third gear. The Sidekick’s little 1.6-liter engine and newly rebuilt transmission sounded like it was about to fall out from underneath its teal shell. Fortunately, the temperature gauge stayed centered and despite the racket, which is nothing unusual, we were on the other side shortly. Before we knew it, we were passing the super creepy abandoned cement factory at Lime, and zooming past the OreIda factory on the Oregon/Idaho border (and yes, OreIda, the potato company, stands for Oregon and Idaho. Hey, I didn’t know that until several years back.). Almost as soon as we crossed the border into the great potato state, the speed limit goes from a leisurely 65 MPH to a supersonic 80 MPH. The Teal Terror is not appeased. Knowing full well we weren’t going to do 80, we went from doing 65–68 MPH to doing about 70–72 instead. As most people know, if the speed limit is 80, most people will do at least 85 if not 90. But not this subcompact 4×4. We got passed by semi trucks. We got passed by RVs. I actually considered buying an orange triangle for the back. Despite our 70 MPH speeds, we were the second slowest thing on the road, next to the guy on the tiny dirt bike on knobby tires who was doing 60. Poor sap. We motored through Boise, which is seemingly always under construction. The lanes were exceedingly narrow, making me thankful I was only pulling our Dinoot trailer and not something with two or three axles. I haven’t spent any time in Boise, but hear good things. After what felt like our 143rd fuel stop outside of Boise, we could get a rough idea of what time we’d arrive in the Twin Falls/Burley, Idaho area. We now needed to decide where to camp. The helpful members of ExpeditionPortal.com had said there weren’t a whole lot of places around the area to camp. Two places that were suggested were Murtaugh Lake County Park and McClendon Spring Campground. One is before Burley, the other is after, respectively. 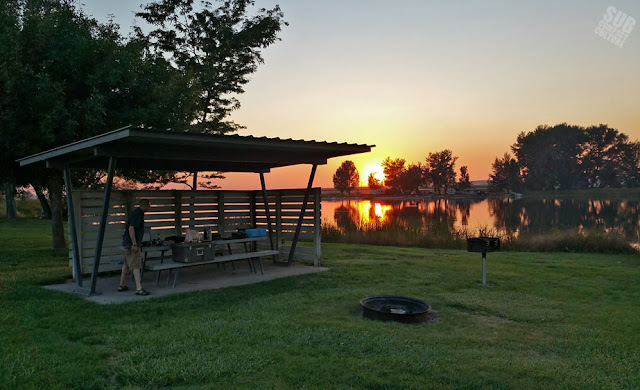 Murtaugh Lake County Campground is an organized campground with vault toilets and, well, Murtaugh Lake. McClendon Springs is dispersed camping. Unfortunately, the members at Expedition Portal had never actually camped at either spot. I did know that at our semi-glacial pace, we’d probably want to stop earlier than later. I was told, however, that being as Murtaugh is a county park, and not too far off the beaten path, that we may have trouble getting a spot on a Saturday. Because of this, we phoned the camp host, who said they’d hold a spot for us. 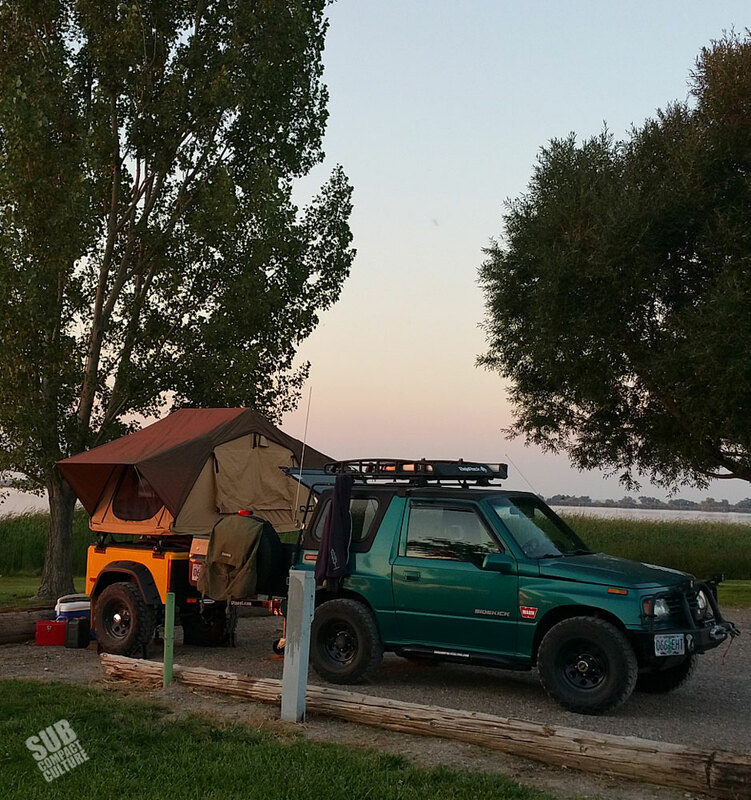 Our camp spot on Murtaugh Lake in Idaho. When we exited I-84 and eventually found the park, we were pleasantly surprised. There were hardly any other people there, and it was quiet and beautiful. There was a plethora of wildlife including many varieties of birds. We also saw what I think was a muskrat. In the video below, you can hear the birds making quite a racket. Once the sun disappeared, so did their sound. The camp hosts were friendly and put is in a great little area. There was a cacophony of bird calls and screeches from avian varieties including Yellow Headed Blackbirds, Killdeer, and other winged creatures. There were also tons of flies. We cooked a late (and easy) dinner of chicken-apple sausages, yellow cauliflower, and a couple of beers. The sun set in an a stunning myriad of oranges and reds, and we hopped in our rooftop tent for the evening. The first day was fairly familiar to both of us. We’d seen I-84 many times, and it’s not that interesting. The second day’s drive to Ouray would prove to be much more entertaining, and a new experience for Mercedes. Then again, long distance travel in a low-horsepower vehicle rarely leaves time for boredom as it takes a lot of concentration to keep up with traffic. And when you’re driving something with the aerodynamics of a brick pulling a shoebox, you’ve always got to be alert. 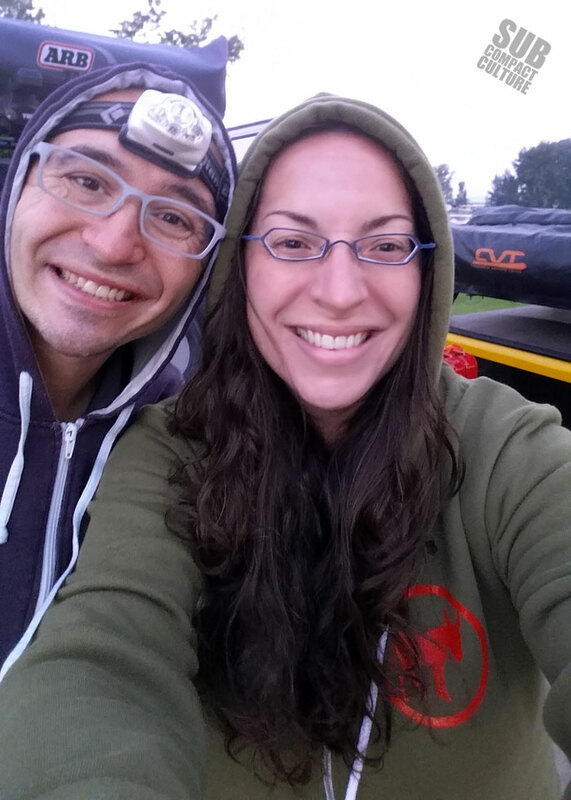 Mercedes and me, happy to have arrived in one piece at our first camping spot. I have a 2001 Suzuki Vitara. Do you ever publish articles on the Vitara??? Yes, although there aren’t many GV or Vitara out there doing adventures we do write about them when we see ‘um. Would you have any suggestions for us? Great story so far, looking forward to more. If you ever take the North Route, I am in North Idaho, Priest River, Bonner’s County. About 1 hour North of Hwy 90. You can come up 41, West of me 3 miles or 95, East of me 20 miles. I can give you a place to set up a tent send you up into the mountains and have a shop to work on you ride if needed. My back ground, I attended Zuki Melt at the Indiana Bad Lands for 9 years as a Trail Guide and Medic. I ran a 4.3 Chevy, 350 Automatic, 5:83 R/P and 4:24 Transfer case in my Sami. Top speed 32 mph in high range. Hot Pink and White Zebra Stripped- Thanks Porter.